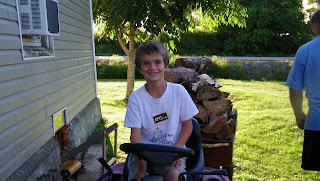 Spring Peeper Farm: Growing up. I was pondering on this past summer, when I realized how much my baby has grown. Not only physically but emotionally and spiritually. He's become more responsible. As much as I hate him growing up, it's also kinda neat. It's amazing seeing this little life you brought into this world, nurture it, love it, teach it, feed it, clothe it, pray over it and hope for the best. Then you see it blossom into a beautiful,God-fearing, God-loving, caring, hardworking person. 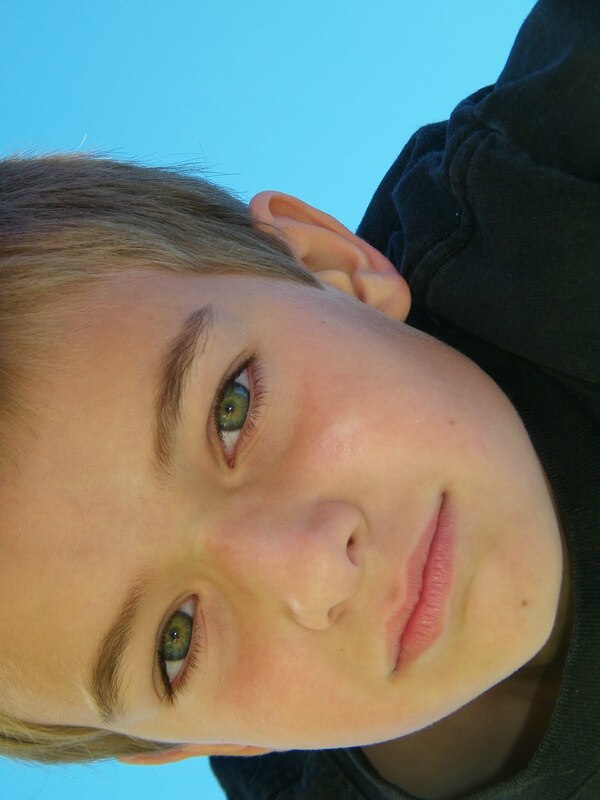 Raising a child, you see the world through new and amazing eyes. You now see that a daisy is not just a pesky weed anymore, but a thing that houses little bugs (yuck), or a way to see if that little girl in your class loves you, or not. 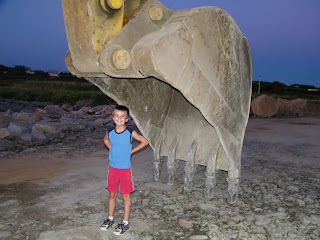 Checking out the big toys at the breakwater they're building. This summer I noticed that J. will get his snacks ready by himself, like using the microwave. Taking a shower and actually getting clean! Dave thought him how to drive the ride-on lawnmower. 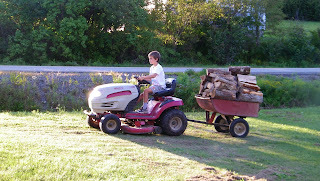 He now loves to bring in the firewood, because he gets to drive the tractor with the trailer. He's doing an excellent job and he's so proud of himself. We're so proud of him to. He goes to pick up the mail by himself. So proud and grown up! Tomorrow is the first day of school. He's going into grade 4!! When he left for his first day of school in grade primary, I told Dave, "You watch, we're going to turn around and he'll be graduating from high school." Dave told me I was nuts. Well guess what...It was just yesterday that he started primary. Well that's what it seems like. Time marches on. Things still need to be done like pigs need to be mucked out, goats need to be milked and puppies need to be taught potty manners. 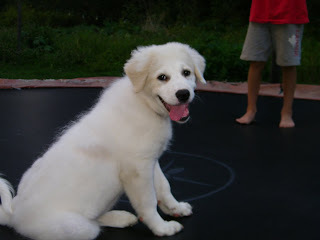 Tundra is also one that is growing like a bad weed. The flea meds we gave her when we first got her stopped working, because she outgrew it before the other dosage was due! She gained 10 lbs in 2 weeks! 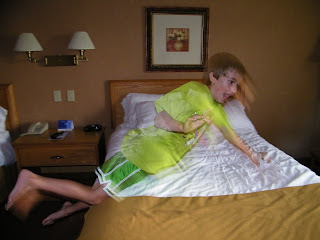 J. jumping on the beds at the hotel. Another little ritual we have in hotels. Can you tell we don't get out often? You can dress us up but you can't take us anywhere! We all went to New Brunswick a few days ago for Dave's arm. We needed to wait over a year for a specialist's appointment here in Nova Scotia. Only a few weeks in New Brunswick. He got a few injections and we are hoping they are going to work. We crossed over on the ferry. It's a long 3 hour ride. But on the way back we chatted with two couples on the boat. They were great. One guy was a Bible thumping, fire and brimstone, Harley Davidson riding,Southern Baptist preacher! Another lady was a dog trainer. The ferry ride, just flew by! We have photos of them, but I didn't ask their permission to put it on my blog, so I won't. But that's what I love about travelling. It's not seeing new places and different things, which that is all fun too, but meeting new people. That's the exciting part! Well we are battening down the hatches for Saturday. Hurricane Earl is going to hit us head on. Crud. We do need the rain, just not the winds. This is a picture of my sunflowers before hurricane Earl. I'll post another one after hurricane Earl on Sunday. I waited and waited and waited for blooms on my sunflowers. I finally got them this week and now Earl's going to show up and razor them. Oh I'm not impressed! But don'tcha find that they grew tall! Dave is 6 feet tall and they are dwarfing him. The heads are supposed to be giants, but I guess they put all their energy in the stalks. Six little piggies and their momma. 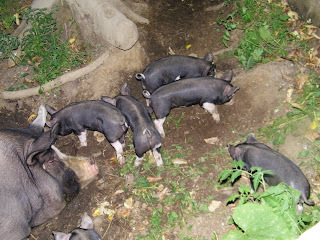 Since there's only 6 piglets in this litter they are growing fast, fast,fast! They've been going outside now for a week. Oh and Ginger passed away this week. She survived the great mink massacre, but she couldn't escape old age. I had had her for over 4 years and she was old when I got her. I don't even remember where I got her from. She had also survived being almost pecked to death by her fellow hens. (Nasty things) But we had nurtured her back to health a few years ago. But old age marched and took over. Your son looks a lot like you. 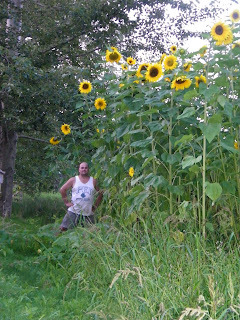 My friend Kellie has sunflowers too, I am amazed at how big they got. The heads on hers got big, I think. Bummer about the wind laying everything flat, hope not your house! I don't think I've ever seen sunflowers that tall here in Alberta. I hope Earl just fizzles out. Those kids grow too fast. My Mother said when my oldest was about four to enjoy these years as they are the best ones of your life (meaning when you kids are young). And I have to agree. Every year we get older and the time goes faster. Hope you weather the hurricane with no damage. Good luck. Hurricane Earl update and autumn update.